Advances in Japanese cinema, as much as any other nation, are about breaks from conventional styles and means of representation. Every generation has turned out a handful of directors whose work has broken the mould to go far beyond the standards set by their contemporaries. One of the first of these was Teinosuke Kinugasa, who all the way back in the 1920s was busily familiarising himself with developments in European cinema, Soviet theories of associative montage and movements in the artistic avant-garde such as expressionism, impressionism and surrealism, and in collaboration with a handful of young experimental writers of the day, known as the Shinkankaku school, or Neo-Perceptionists (sometimes referred to as the Neo-Sensationalists), became the first director in Japan to realise his ambition of treating cinema as a distinct art form in its own right, divorced from the commercial concerns of the new mass-audience medium. Based on a treatment by the later 1968 Nobel Prize winning novelist Yasunari Kawabata (1899-1972), writer of such classics of modern Japanese literature as The Izu Dancer and Snow Country, Kinugasa's self-financed landmark production Kurutta Ippeiji, hereafter referred to as A Page of Madness (though some sources refer to it by the titles A Crazy Page or A Page Out of Order, and Aaron Gerow's groundbreaking book on the film argues that the Japanese title should in fact be read as Kurutta Ichipeiji) seems a far cry from the bog-standard theatrically derived Kabuki adaptations and jidai-geki period swashbucklers being produced at the time en masse. The story of a retired sailor who has taken a job as a janitor in a lunatic asylum to look after his insane wife, locked away after attempting to drown their child, a synopsis of the plot can't begin to explain the power of the film, nor the audacity of its vision. A stunning invocation of the world as viewed by the mentally ill, within minutes, as the rapid montage of the opening storm sequences dissolves into the surrealistic fantasy of the sailor's wife dressed in an exotic costume dancing in front of an art-deco inspired backdrop featuring a large spinning ball flanked by ornate fountains, A Page of Madness bowls you over with a barrage of startling images utilising every technique known to filmmakers of the time. Even now, Kinugasa's film seems as fresh as a daisy and when seen on the big screen, as eye-popping an experience as anything you're likely to see released nowadays. At the time all of this passed by unnoticed by the rest of the world, and its impact on subsequent Japanese productions seems negligible, as the film, like so many films produced in Japan during the silent period, disappeared without a trace for fifty years. Fortunately it cropped up again in the director's garden shed in 1971, and Kinugasa struck up a fresh print, complete with a newly composed musical score and released it around the rest of the world. For the first time A Page of Madness could be seen outside of its country of origin, affording contemporary viewers the opportunity to place the film within a historical context alongside other seminal films produced during the silent period, revealing that in many respects, Kinugasa was way ahead of the game. 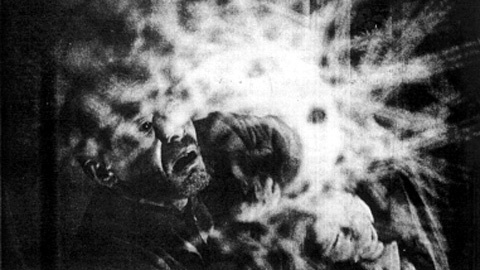 As the writer Vlada Petric states in an essay entitled A Page of Madness: A Neglected Masterpiece of Silent Cinema, published in the Fall 1983 edition of Film Criticism, "The fact remains that historically Kinugasa made the first full feature film whose plot development is radically subverted, whilst its cinematic structure includes virtually every film device known at the time. These devices, moreover, are used not for their own sake but to convey complex psychological content without the aid of titles". A despondent Kinugasa, near-bankrupt after footing the bill for the film's production, returned to commercial production for a couple of years before embarking on his next artistic experimentation, Jujiro (Crossroads, sometimes known as Crossways, or The Slums of Yoshiwara) in 1928. Described by the director as "a chambara without swordfights", this nihilistic tale, set in Tokyo's pleasure quarter during the Edo Period, focuses on the unrequited love and desperation of a young man, temporarily blinded and publicly humiliated by a rival at an archery ground. Kinugasa barely waited for the screens to cool down after its initial run in Japan before hotfooting it to Moscow to show off his baby to his Soviet cinematic idols, Sergei Eisenstein and Vsevolod Pudovkin. His next stop was Berlin, where he managed to sell the film for exhibition. Crossroads thus became the first Japanese feature to be shown in Europe, and went on to play in, amongst other places Paris, London and New York. Kinugasa spent two years in Paris studying the new sound synchronisation techniques before returning to Japan to re-continue his prolific output, until his last film in 1967, a Russian co-production entitled The Little Runaway (Chiisai Tobosha). With over 110 films under his belt, the rediscovery of A Page of Madness, which the director nostalgically considered as the favourite of all his creations, rekindled a great deal of interest in the director and provided a crucial missing link in the annals of film history unlike anything thought to have existed at the time. Over the years A Page of Madness' technical merits, its meaning and the circumstances surrounding what has been described as its "virgin birth" have been scrutinised and documented at great length. Mariann Lewinsky, Swiss film historian and specialist of Japanese Silent Cinema has spent twenty years researching the film, and her book on the subject, Eine verrückte Seite - Stummfilm und filmische Avantgarde in Japan (Chronos Zürich), was published in 1997. She was kind enough to talk to Midnight Eye in order to help us sort out the fact from the fiction. First of all, can you please explain to me your background in Japanese cinema, and your personal involvement in A Page of Madness? I saw A Page of Madness for the first time about 20 years ago, in 1981. A friend, whom I had met at my first film festival (Locarno 1972), had asked me about the written characters that appear at one moment, before the janitor starts to daydream about the fair. Since I was studying Japanese at the time, I was able to tell him that the characters meant "Big Lottery", but I found that watching the film was a troubling experience, because very strong emotions and visual effects hit you, but there are no means of understanding exactly what is going on, nor why the film is like it is - and all that I found very irritating. A Page of Madness made me switch from Japanese literature to film and turned me into a real researcher and historian, since it forced me to go and look on my own for the knowledge I needed to understand it. It made me ask questions. Was it typical for a film of the 1920s, or an exception? How was cinema at that time and place? What was the relationship between this film and the films of the European avant-garde? Initially, this led to me becoming a specialist of Japanese cinema, and later on, in the problems of transmission, preservation and presentation of old films. Looking back made me think that a situation of extreme lack of information is the best thing that can happen to you. You stop fooling around with second-hand information. As for Japanese cinema in general, I have organised many retrospectives and screenings, edited a book on the director Keisuke Kinoshita, and a collection of Japanese ghost stories, and have taught Japanese cinema at several universities (Zürich, Lausanne and Heidelberg). Some years ago I decided to give up Japanese film as I'd become involved in other fields of research. I haven't been to Japan at all in the past seven years. But somehow Japan and A Page of Madness keep returning: there was the Sacile retrospective last autumn, and I was asked to do a screening at the Louvre in October 2001, and so on. Eine Verrückte Seite - Stummfilm und filmische Avant-Garde in Japan (A Page of Madness - Silent Cinema and the Cinematic Avant-Garde in Japan) was written in 1991-94 and published in 1997. Its first two parts are on Japanese silent cinema in general, about the development and characteristics of domestic production - basically the studio system - and about the structure of the market, with its strong presence of foreign production up to the Pacific War. A basic condition of the Japanese silent cinema was the mode of exhibition, e.g. the combination of a silent film with the so-called film narration of a professional artist, the benshi - think about a highly specialised speaker, voice imitator, dubber, story-teller, radio play actor. While in Europe in the silent period there was no screening without live music, in Japan there was no screening without music and human voice, neither for Japanese films nor imported ones. My first experience of a film with benshi narration was Way Down East by D.W. Griffith in Nagoya in 1982. The average age of the audience, including the narrator, was around 75. There has been a tendency in Western writing about Japanese cinema to define the benshi as a "traditional" element and to conceive of it as an antithesis to the "modern", but that is of course sheer ignorance and says nothing, except that this statement implies that all things modern are defined as being Western and claimed for "our side", and all things non-Western are defined "traditional" (in negative terms, obsolete; in more positive terms, authentic). All these Western writers and travellers have expressed for more than a hundred years their amazement that Japan is such a mixture between the "modern" and the "traditional". If you think about it, so is all of Europe. The benshi was the main element in Japanese cinema well into the 1930s, and as dynamic and fast changing an element as the rest of the field of cinema, a part of the modern culture of urban Japan. The latter half of the book is about the film A Page of Madness, detailing the historical and cultural facts - background, production, exhibition, reception - as well as an analysis, interpretation and investigation into the film as a material object. What do we see today? The only version accessible is the one that Kinugasa released in 1971. The most important conclusions, based on the available documents of the time of the first release (such as censorship data - which is a very reliable source -, cinema programmes, interviews published at the time with the people involved, a benshi libretto of the first two reels, etc.) are that we have not seen the original version, as released in 1926, but a re-cut version from 1971 lacking about 500 metres as compared to the original version. It was Kinugasa himself that prepared this sound version after he had found the film. In the appendix there are translations of the most important contemporary sources - four texts by Yasunori Kawabata, a writer and collaborator on A Page of Madness and an excellent informant, and the benshi libretto for the first two reels by its narrator in Kyoto named Kyokka Ishida. There are also statistics of the film market, a detailed decoupage of the film and the things you want to have at hand, like filmographies, etc. Are there any plans to have it printed in English? There are no plans to have the book translated and published in English. Once it was finished I became occupied with other things. The English speaking part of the world tends to be a bit isolated through its lack of reading in other languages. Why is A Page of Madness such an important film in the history of Japanese cinema and how did it differ from films made it Japan up until this time? A film is deemed to be important for many reasons: Because it is unique, or because it is a prototype for a new and successful genre, or because it typifies a group of films, an author, production mode or state of the technology, etc. Films lose or acquire importance with the passage of time. Importance is often a secondary effect of written history, and the film historiography has both its traditional villains (the evil of commercial production) and heroes and martyrs (noble directors pursuing film art). A Page of Madness did not change the course of history of Japanese film. It is an important film, among other reasons, because it documents that the avant-garde movement in Japan, very productive in other fields (theatre, dance, visual arts, literature), at its peak was strong enough to produce one single film, and certainly a remarkable one. A Page of Madness is the Japanese contribution to the international avant-garde cinema of the 1920s, and also the participation of cinema in the Japanese avant-garde movement. For Japan in 1926 it is unique and important as a manifesto of Film as Art and of Art as International and Absolute. It would take too long to explain all of this in depth, but it all connects to the market structure, to the position of cinema in the society in question, etc. Japan was similar to the USA for the tight market that didn't allow for independent production and distribution. Compared to the West, cinema in Japan figured even lower in the cultural hierarchy. The attempt to redefine cinema as High Culture was even more difficult there than elsewhere - and it failed. On the other hand, the industrial production in Japan was very open to formal experiments, and so the low-culture commercial Japanese cinema produced on a very high level of artistic quality, and absorbed its own experimental tendencies. Take a look at Yasujiro Ozu, Hiroshi Shimizu, and Daisuke Ito, for example. What aspects of the film particularly interest and impress you? The film for me has a double life. If its effect hit me as spectator, the impact is quite different from my mental image, which is based more on the production side, the way the film is constructed, its poetics. On the screen, as an emotional experience, it is more violent and desperate when I consider it from its aesthetic side where I feel very much the enthusiasm and the sheer creativity of its makers trying out new ways of doing things. The overall structure of the film combines all three categories of filmmaking e.g. fiction, documentary, and experimental. Like many other films of its time, A Page of Madness undertakes an exploration of how to visualise the invisible, the mind. To quote a statement of old Théophile Pathé: "You can't film a dream. It is invisible to the human eye." The shifts between the different levels of reality are indicated in so many different and often very delicate ways. Think about the beautiful image of the sleeping dancer, who in her sleep softly turns her head to the other side, indicating the switch to the other side of reality. I like the attitude towards madness and its representation in the film, so different from the demonising Angst-Lust of German Weimar cinema. A Page of Madness shows mental illness with much empathy towards human suffering, with its opaqueness, its violence and paralysis. The mental images show not only nightmares and hallucinations, of both the sane and mentally ill characters, but also imaginations of restored integrality, of beauty, and laughter. A good example is the dancer with her torn dress on the level of reality, who appears in mental images in beautiful dresses. What was the background of the director Teinosuke Kinugasa? Kinugasa was born in 1896 and died in 1982. He came from a well-to-do merchant family. As a boy, his mother often took him to the theatre and as an adolescent he acted in school plays. In 1914 he became a member of a Shimpa troupe and got formation as an onnagata (actor of female roles). He had strong ties to the theatre all his life, and when the Japanese film industry faltered in the sixties, he returned to direct plays, many of them starring his favourite actor Kazue Hasegawa, also a former onnagata. Hasegawa (aka Chojiro Hayashi) entered the Kinugasa-Shochiku production in 1927, and their collaboration lasted all their lives. They left Shochiku for Toho in 1940, worked together in Hasegawa's own production in 1948-49, and finally went to Daiei. Throughout his writings one gets the impression of a lively and easy-going man who enjoyed his work a lot, held open-minded leftist opinions (during militarism, the cinema and theatre community were for a long time a rather safe haven for persons with leftist ideas) and who would try out things, maybe not so much out of artistic ambition or ideals, but for amusement, for a change. He certainly was a professional and had no problem whatsoever in producing a lot of well-made genre formula stuff. Kinugasa entered the cinema as an onnagata, signing up with Nikkatsu in 1917 and playing in about 130 films (all of them lost) until 1922, when he left Nikkatsu in protest with all their onnagata actors when the production firm started employing actresses. He directed his first film for Nikkatsu in 1920, in which he also played the female lead. He became a director for Makino in 1923 and gave up acting for good in the same year. A Page of Madness was his 35th film - he was a highly experienced director at that time, aged 30, and the few surviving fragments from works prior to A Page of Madness look very convincing. All in all, Kinugasa directed 116 films. Such a prolific filmography is not that unusual for a director who started in 1920 and worked for over four decades; in Europe, the production rate in the 1910s was comparably high. Can you please explain how A Page of Madness came to be made? It was an independent production, financed by Kinugasa himself, but shot in a professional manner in a studio (Shochiku Shimogamo in Kyoto) with professional technicians and equipment. We know a lot about the shooting of the film since one of the collaborators was a young writer, Kawabata (the later Nobel prize winner), who wrote and published before, during and after the shooting several texts about the experience. As a collaborator Kawabata provided a kind of treatment, not a finished scenario. He published a manifesto text about the next production, a scenario after the film was finished, a diary from the days in the Kyoto studio, and a short story about the masks. Another important collaborator was Masao Inoue, one of the great actors of that time (more so in theatre, but he had also directed some films in the early 1920s), who plays the male lead and gave Kinugasa a lot of support (with both his expertise and his prestige). What were Kinugasa's own particular influences? Eisenstein and Vertov are often quoted, but I believe there was no evidence that Kinugasa had seen any of the films by these two directors. From late 1924 onward, films from the French so-called first avant-garde arrived in Japan and met there with enthusiasm; many of them Albatros Productions of Russian emigrants in France like Tourjansky and Volkov, but also La Roue by Abel Gance and films by Marcel L'Herbier. The accelerated montage as seen in Kean and of course La Roue was immediately adopted by Japanese directors (see the samurai film Orochi, 1925) and Kinugasa uses it twice at the very beginning of his film to great effect (for the storm and the dancer). While films from the USSR were banned in Japan [JS - communism was considered a subversive influence during the Taisho period (1912-26), with the Japanese communist party disbanded by the government in 1925 and the activities of leftist groups severely suppressed by the government], the Japanese public knew about the major films of German expressionistic cinema and the Weimar authors like Murnau and Lang. The strongest direct influence was certainly Murnau's Der Letzte Mann / The Last Laugh. There was much debate in Japanese film magazines about this film - it was released in Kyoto in January and in Tokyo in mid-April 1926 (A Page of Madness was shot in May 1926) - and its having no intertitles. In a published enquiry (poll) "My Favourite Film", Kinugasa chose The Last Laugh saying he had seen it five times. If you compare the two films you will find many elements and images from the German film used in A Page of Madness, but transformed and integrated in a different structure. A Page of Madness has been described as "surrealistic", "avant-garde", "a masterpiece of expressionism" and often compared to The Cabinet of Dr Caligari. How accurate are these descriptions? Terms like "surrealistic", "expressionistic" and "avant-garde" are used either in a very broad sense, then meaning something like "artistic", or they can be used in their more precise historic sense, expressionism being a German art movement of the 1910s, surrealism being a French movement of the 20s, and avant-gardes (like Nouvelle Vagues / New Waves, better used in the plural) for the many national movements breaking with conventional forms. The comparison with Dr Caligari is quite pointless I think. This German film from 1919, despite being popular in Japan, is too different in its mood and making, and its treatment of madness has nothing in common with A Page of Madness. How important was narrative to Kinugasa? Or is A Page of Madness best viewed as an aesthetic achievement? Donald Richie makes a distinction between cinematic expressionism and impressionism, citing A Page of Madness as an example of the latter. Do you believe Kinugasa made such a distinction, or is this point of view something created by Richie? When Anderson and Richie wrote their book on Japanese cinema in 1959, no print of A Page of Madness was available and they hadn't seen the film. But their definition, distinction and attribution is basically correct, "impressionism" being an older term for the aforementioned first French avant-garde. An "impressionistic" film like Kirsanoff's M&eacut;nilmontant, made like Kinugasa's film in 1926 but released in Japan only in September 1927, shows a lot of affinity with Kinugasa's experiment. How standard was the use of such practices as superimposition, cross-cutting, distorted images and rapid montages at the time period? Japanese filmmakers, like filmmakers all over the world, would pick up and use all the interesting and exciting new techniques whenever and wherever they appeared, and also tried constantly to find new ones of their own. Much of the production in Japan was genre film and much of genre film was samurai films, each of them presenting several long fight scenes - so there was high pressure for technical and visual variation and innovation since they had to present the same thing over and over again in a new and attractive way. Of course, the concentration of the experimental devices and techniques in A Page of Madness is higher than elsewhere. It is like a sampler of all the techniques available at the time plus all the ones Kinugasa and his collaborators could think of. Their main concern was the shifts between reality and imagination/memory/dream. The most intrinsically Japanese aspect of the film occurs when the asylum inmates are required to put on Noh masks. What is the significance of this? In the last sequence before the final closure, a Western audience feels insecure because it has no spontaneous understanding of the Noh and may be disturbed by a suspicion that its interpretation of the mask (marked in the Western culture by negative allusions of a false beauty hiding the horrible truth) may not apply. If only you trust your perception, you will understand perfectly well what is going on in this sequence. The man imagines himself to be laughing happily bringing as basket full of masks to the inmates and handing them out. The moment they don the masks their obsessively rhythmic movements stop; they relax. Then the man puts a mask on his deranged wife's brooding face and dons one himself. A beautiful close-up shows man and wife with their radiant masks - hers softly smiling, his wrinkled but happy laughter - the image of a couple united, an image of happiness. The sequence is his fantasy of being able to overcome the mental separation from his wife. And to bring the deranged inmates deliverance from suffering. It functions, as intended by the authors (Kawabata tells us) indeed as an imagined happy end (and in the longer original version it worked as an indication of the happy end to be, the marriage of her daughter and her fianc&eacut;). There are further insights if one tries to consider the Noh masks and the use the film makes of them. Noh is no ordinary stage entertainment, and a Noh mask is no ordinary prop. Noh belongs to the loftiest High culture, aristocratic in its origin, ritual in function. By using the masks, its most charged and prized element, the makers of A Page of Madness make a programmatic statement, claiming the status of High Art for their film, product of that very low class medium, the cinema. Using the masks freely, separated from their context, they make an ostentatious break with tradition. All of their implicit and explicit goals are fulfilled perfectly and to the advantage of the film because the masks are not desecrated or used in an arbitrary way. Their original power and function is realised in a different context; with their appearance, moods and rules of the Noh play are invoked and subtle affinities of the film with the Noh are accentuated. Many Noh plays deal with human suffering, and one of the five categories of Noh plays are about madness; about people, usually women, gone mad through despair, longing, exhaustion, betrayal, grief of jealousy. The Noh has an aesthetic and dramatic side, telling these haunting stories, and has a ritual side of transforming, soothing and liberating the human mind from suffering and giving it peace. This function is invoked in the mask sequence. Okina, the Divine Old Man whose white mask Inoue dons, brings good fortune and divine blessing. It is the oldest and most sacred type of Noh mask (called hakushikijo). The ritual of the Okina dance is performed only on New Year, the highest holiday of the year, to invoke blessing and good fortune, and for the same purpose, on rare occasions like the inauguration of a new stage. Maybe it was purely a case that among the masks they could borrow from an antique dealer for the shooting there was also a white Okina, but this mask underlines the positive power of the scene approaching the protagonist into the laughing divinity who brings blessing and happiness. Japanese silent films, and those imported and shown in Japan made significant use of benshi narration. A Page of Madness did not use a benshi. Was it the first film of its type in this respect and how did this influence contemporary audience's reactions to the film? Did it inspire other silent directors to take this same narrative route? I do not know who put about this completely unfounded story about A Page of Madness being shown without a benshi or film narrator into circulation but it is apparently still going strong. There is a 1977 interview (in Dutch) by Ian Buruma with Kinugasa telling about the benshi narration, and Joseph B Anderson in his 1982 essay in the expanded edition of The Japanese Film, and again in a learned and highly readable essay in Reframing Japanese Cinema (1992) says all there is to know about benshi cinema in general and in detail. There is a normative theory of film art in the West which has a cherished object, the pure film, a film purged of the impurities of language, theatre and narrative. Some people were seduced by this notion to recognise in A Page of Madness the pure film of their dreams, but they were completely wrong. They have only seen one element, isolated, of a combined art form, and an incomplete element at that. There are many instances in A Page of Madness where the film relies on benshi narration to furnish crucial information. Without narration, without dialogue, the film at times is nearly incomprehensible. Kinugasa had enormous difficulties in releasing A Page of Madness once it was finished. Finally, thanks to the staunch support of top benshi Musei Tokugawa, it premiered in the Musashinokan, a Tokyo premiere cinema for Western films, with the narration of Musei himself, and a most grateful Kinugasa remembers the experience in his memoirs [JS - Waga Eiga no Seishun ("The Spring Time of My Life in the Movies") was published in 1977] with high praise for this outstanding artist. Around 1930 there were, according to official statistics, 1300 cinemas in Japan, 7000 benshi and 5500 cinema musicians. The change to sound came slower and later elsewhere, but by 1936 all major production firms had stopped silent production (Ozu was the last of all important directors, making his first sound film in the same year), but smaller production companies continued and in 1937 there were still 137 silent films made in Japan. Many benshi changed profession, others continued working with the old films: in 1940, over 1200 persons registered as profession: benshi. The end of silent film in the West and in Japan was imposed by the industry and the market, not by any inner need or natural evolution. To put it clearly, there is no progress in pleasure and no progress in art - there are only different ways of doing things. Silent cinema was a highly pleasurable and fully mature form. It didn't lack anything, least in Japan, where there was always the human voice doing the dialogues and the commentary. Sound films were not better, just more economical. As a cinema owner you didn't have to pay the wages of musicians and benshi any more. And a good benshi was a star demanding star payment. Nowadays, public screenings of the film or its video incarnations are accompanied by a number of different soundtracks. What was its aural accompaniment when it was originally screened? Obviously, the synergy between the images and the soundtrack combine to create a unique aesthetic effect. What different soundtracks exist nowadays for it? I have not found any information about the original musical accompaniment. Cinema orchestras in Japan usually combined Western and Japanese instruments, and the solo piano so frequently used in Europe and the USA seems to have been much rarer. But film music has a task. It must aid the viewer to a better vision of the given film by enhancing the visual and emotional action. In the case of A Page of Madness the music should help the audience understand the shifts from reality to imagination and back. I have experimented in some screenings of the film with a minimum of live commentary and it works very well, since the audience is not distracted by the difficult task of understanding who is who and what is going on, and so they don't end up getting completely bewildered straight away, allowing themselves to concentrate on a very beautiful and impressive and coherent film. It is a film that needs a benshi. Kinugasa produced a sound version for the re-release in 1972. The music is fine, but this version has one major problem: wrong projection speed. The film should be projected at 20 frames/second. Sound speed at 24 f/s destroys the rhythm and flattens movements and facial expressions in an all-over hastiness. Sound versions have an additional problem: wrong format. The actual soundtrack physically cuts a part of the image and a standard sound copy also cuts off the upper part of the image. You lose about 20% of the full frame aperture of silent film, and of course frame composition is decentered throughout the film. The film was considered lost for an incredibly long time. What happened to it, and where and when was it found? After the release in autumn 1926, A Page of Madness disappeared and it was believed lost forever after a fire in the Shimogamo studios in 1950 along with all the films stored there. Kinugasa found both a negative and a positive print in late 1971 completely by accident in his own store house. It is not remarkable that the film was lost. It happened to nearly all Japanese silent films. Japanese silent cinema has by far the worst survival rate of any major film-producing nation, maybe with the exception of India. There is next to nothing left of the productions before 1923 when the Kanto earthquake destroyed the Nikkatsu depot (Nikkatsu production was again wiped out in the Pacific War). During the 1920s an estimated 7000 films were made in Japan. Of these a maximum of 1% are still in existence, most of them as very bad copies. A Page of Madness survived because it was not a normal production but an exception. As the film's producer, Kinugasa himself owned the material. Other Japanese films of the time have survived because of exceptional circumstances. For example, they were exported and found their way into European film archives (three films were recently rediscovered in Brussels, one in London, and several in Moscow). How much restoration was needed on the film? Were any frames damaged beyond repair? I can really only use conjecture in answering this question, since the only way to give a precise answer would be to check the original material found by Kinugasa in 1971 (if it is still in existence) and to compare it with the prints we know. Kinugasa says that the positive print, from which the dupe-negative was made and all known prints were produced from, was shrunk but otherwise in perfect condition. This dupe negative was made at the Imagica lab, a professional commercial laboratory. At that time, know-how about film restoration was still pretty low, and important techniques such as wetgate-printing unknown. If you compare the print with Kinugasa's 1928 film Jujiro (Crossroads), which survived in a good nitrate print, you can tell that the new print of A Page of Madness has too much contrast and too rough a grain. It should be more silvery with a much finer gradation of greys. Some of this is down to what we have lost, unfortunately by bad reproduction. As I mentioned before, the trouble with A Page of Madness is completeness. In 1926 it was about 500 metres longer. The main suspect is Kinugasa himself. I often think about going back to Japan to look for this lost 500m, but the chances are strong that he directly recut the original print in order to have the dupe-negative made and that the out-takes were thrown away. He did this in the case of Jujiro, but fortunately in this case it was not the only print in existence. What did Kinugasa do in the two-year interim period between A Page of Madness and Jujiro? After A Page of Madness, Kinugasa produced and directed jidai-geki for Shochiku. A good example of this production has survived in the Brussels Film Archive, the film Fuunjoshi (Story of the Castle of Wind and Cloud) starring Chojiro Hayashi (Hasegawa) and the lovely Akiko Chihaya, who appears also in Jujiro. She later became Kinugasa's wife. In 1928 Kinugasa went to Europe and got Crossroads distributed in many countries. For a long time it was the only Japanese film known here. He visited the USSR and met Eisenstein. After his return he continued as a director for Shochiku, and made some highly successful films, such as the great trilogy Yukinojo Henge - maybe you know the remake by Kon Ichikawa, An Actor's Revenge, again starring Hasegawa in celebration of his 300th film appearance. Perhaps Kinugasa's best known film is Gate of Hell (Jigokumon) in 1952, which not only was one of the first Japanese film to be filmed in colour, but also achieved a great deal of success abroad, most notably at Cannes in 1954. Can you tell me any more about this film? Kinugasa told Buruma in 1977 that he found it really ridiculous that Jigokumon got the prize at Cannes, and he was right. With Rashomon, Japanese films became the in-thing at festivals for several years and won many prizes, and as with the Taiwanese and Iranian films today, not all juries could distinguish between real achievements or just another exotic, tastefully artistic looking film. I think Wong Kar-wai is one of the very great filmmakers of our time, whereas Tsai Ming Liang is your archetypical pretentious festival fraud. What type of films did Kinugasa make in the period between Jujiro and Jigokumon? Did he continue with this type of formal experimentation / pioneering, or did he become more mainstream? Kinugasa continued working in a more mainstream fashion afterwards. Times in general had changed and the Golden Twenties turned into the Iron Thirties and Ashen Forties. His last experimental fling was an avant-garde combination of theatre and film projection made in collaboration with Koreya Senda. He made many period films and from time to time, some very good films indeed, usually in connection with theatre. His film about the actress Sumiko Matsui, Joyu (Actress, 1947) is clearly superior to Mizoguchi's film on the same subject of the same year. In his last period he became a specialist in Meiji-period melodrama, adapting novels by Kyoka Izumi, and whilst these films looked rather stuffy when they came out in the late 1950s and the 1960s, today, with all their artificiality and mannerisms, they are fascinating and can be compared with Douglas Sirk's melodramas. I like to think that Kinugasa trained the last onnagata in Japanese cinema, since he taught a young and not very talented actress. She plays the female protagonist role of melodramas as instructed by the old onnagata, and there is something rather strange and moving about it.